When one has a good thing going, why not make more? That’s exactly what the folks at General Motors are doing with the 2013 GMC Terrain Denali AWD, capitalizing on the success of the Denali trim package. 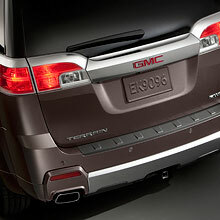 We were already fans of the new Terrain, so an upgraded trim with the Denali moniker sounded interesting. The exterior of the 2013 GMC Terrain Denali AWD features high-end details, including 19-inch satin chrome clad wheels that really set off the look of this sporty SUV. Some of the other standout features included a signature chrome grille, satin chrome accents, body color front and rear fascias, body color rocker panels with satin chrome molding, new headlamp and tail lamp designs, and dual chrome finish exhaust outlets (single outlet on 2.4L). 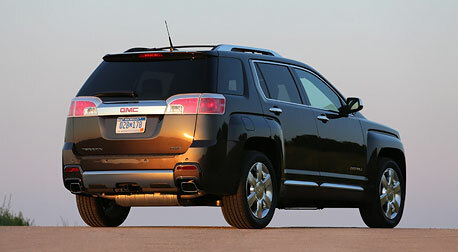 The all-new 2013 Terrain Denali is engineered to bring a higher level of technology and performance to this already capable and efficient small SUV. The Terrain’s bold exterior is accentuated by signature Denali design cues and premium features that let this small SUV announce its presence in a professional way. Our test model was painted in jet black and sported other features that potential car buyers will appreciate, including deep tinted glass, power sun roof, halogen headlamps, front fog lamps, programmable power rear lift gate, chrome door handles, heated power mirrors, trailering package, roof rack side rails, rear skid plates and rear parking assist. There is a lot of chrome on the 2013 GMC Terrain Denali AWD, which fits quite well with the overall design of this sleek offering in the SUV segment. 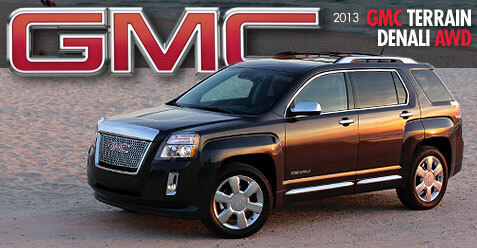 The 2013 Terrain Denali takes GMC’s trademark attention to detail and comfort to a new level and refinement that GMC proudly delivers in an SUV of this size. When we stepped into the vehicle, we experienced refinement galore with the kind of upgrades that puts Terrain Denali in a class with luxury brands. The soft-touch leather and wood accents provide a premium look and feel to the interior features that include soft-touch dash and upper instrument panel, color touch radio with 7-inch screen, CD/MP3 player, GMC IntelliLink hands-free smartphone integration with Bluetooth audio streaming voice-activated audio controls, premium 8-speaker system with amplifier and equalization, leather-wrapped steering wheel with wood accents, rear vision camera system, iridium black leather seating, driver and front passenger heated seats, automated climate control, universal home remote, XM radio, and the venerable and segment exclusive Multi Flex sliding rear seat. 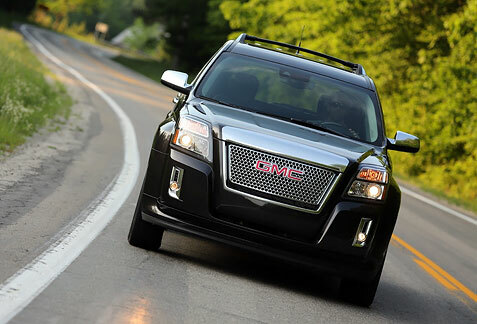 Forward collision alert and lane departure warning are standard on the Terrain Denali. They use the industry’s first single-camera crash-avoidance system to visually and audibly warn drivers when a collision is imminent or the vehicle crosses a lane marker. In addition, side blind zone and rear cross traffic alert help avoid collisions by using radar to watch spots the driver may not be able to see and provide visible and audible warnings. Convenience features, such as a programmable power lift gate, are standard on the Terrain Denali. At the touch of a button, owners can access the vehicle’s 63.9 cubic feet of cargo space (behind the first row), while a memory function stops the lift gate at a chosen height to help shorter drivers or accommodate low garage heights. Available technologies include color touch navigation and a rear-seat entertainment system. 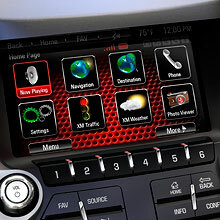 As with every new GMC, the Terrain Denali comes with six free months of OnStar’s Directions and Connections plan. It includes Automatic Crash Response, Turn-by-Turn Navigation, roadside assistance, emergency services link, stolen vehicle assistance and remote door unlock. 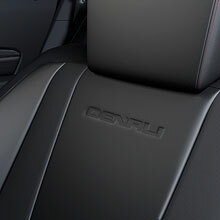 The fit and finish of the 2013 GMC Terrain Denali AWD interior rivals much more expensive brands and is quite frankly more upscale than at least a few. 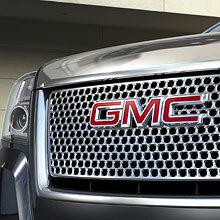 With the introduction of the Terrain Denali, GMC also announced a new 3.6-liter V-6 engine with direct injection and continuously variable valve timing will replace the current 3.0-liter V-6 engine in the Terrain lineup for the 2013 model year. SAE certified at 301 horsepower (224 kW) and 272 lb.-ft. (369 Nm) of torque, this engine makes more power and torque, but is expected to deliver fuel economy equal to its predecessor. The power at takeoff is nothing short of pure enjoyment as you can feel the horses working, giving the driver the confidence to manage all driving scenarios presented. The new V-6 uses lightweight components that contribute to the Terrain’s fuel efficiency while boosting its horsepower. An integrated cylinder head/exhaust manifold design saves about 13 pounds compared to a non-integrated design, while a composite intake manifold saves about 5.5 pounds vs. an aluminum intake. Additionally, a lightweight structural front cover and high-strength connecting rods save additional weight. New dual-flow dampers are exclusive to the Terrain Denali’s suspension system. This technology provides a smoother ride and improved handling by controlling suspension dampening across a broader range of driving conditions. As good as the 2013 GMC Terrain Denali AWD may look with the new trim and the upscale interior, the performance is what we’ll remember the most. The Terrain Denali delivers professional grade handling and drive dynamics, including StabiliTrak with Traction Control. You also get the choice of two efficient and powerful engine choices – both featuring Variable Valve Timing and Direct Injection technology to maximize power and fuel efficiency. GMC was smart to incorporate the Denali package into the new Terrain as they have built a top-notch SUV that scores very in high in pretty much all categories with us. The sticker came in at $41,525, and when compared to competitors offering similar technologies and options, the 2013 GMC Terrain Denali AWD will find plenty of satisfied customers!